This is a truly magical region in the foothills of the Spanish Pyrenees. It is packed with dramatic landscapes, thousand-year-old castles, hermitages built into cliff-faces, exceptionally quaint villages, great weather, wonderful walking, original places to stay, and distinctively Aragonese cuisine. Aragon is a truly enchanting kingdom, a world unto itself, and your walking holiday includes a village they say is at the end of the world. But the "magic" comes from the frequent surprises (natural and man made) you get whilst walking through this panoramic landscape. For example, on just one walk you will find stunning, pink cliffs rising a sheer 1,000 feet above you; ancient hermitages cut into rock; almost hidden shepherds' huts; panoramic views of the Ebro plain and the High Pyrenees mountains; an abandoned village; a Roman bridge; a lovely waterfall. And that is without talking about the "magical" light that characterises Aragon, or its distinctive cuisine and hotels. It is a real surprise that, with all this on offer, there are not many more foreign visitors. Unsurprisingly, we thoroughly recommend it. Standard option: You drive yourself to you first night's hotel, which will be in Loarre. The first night is on a dinner, bed and breakfast basis at the three star Hospederia de Loarre (see Day 2). With extra airport pick-up: We will meet you at Zaragoza airport (flights from London five times a week, other UK cities, or Paris three times a week) or railway station and take you to your first night's hotel, which is in Zaragoza itself. Pick-ups also available from Madrid or Barcelona (please consult us for prices). You will stay in a grand hotel close to the charming historic quarter leaving you free to explore the capital of the region of Aragon. There are Roman ruins, Muslim masterpieces, a magical basilica, magnificent stone bridges over the Ebro, and the city's renowned tapas bars. You will wonder why it is not much more popular with discerning tourists. In Zaragoza, you stay at the four star Hôtel Catalonia el Pilar close to everything you will want to visit, particularly the see-it-to-believe-it Basilica de Pilar. and a short distance from the banks of the Ebro. You stay on a bed and breakfast basis, so you can choose where to eat from the multitude of tapas bars and authentic restaurants. If you drive, then you stay in Loarre as described above see day 2 for a description of the hotel). Transfer time : 15 minutes. After breakfast, we transfer you to the historic village of Loarre (if you have not already driven yourself here yesterday). 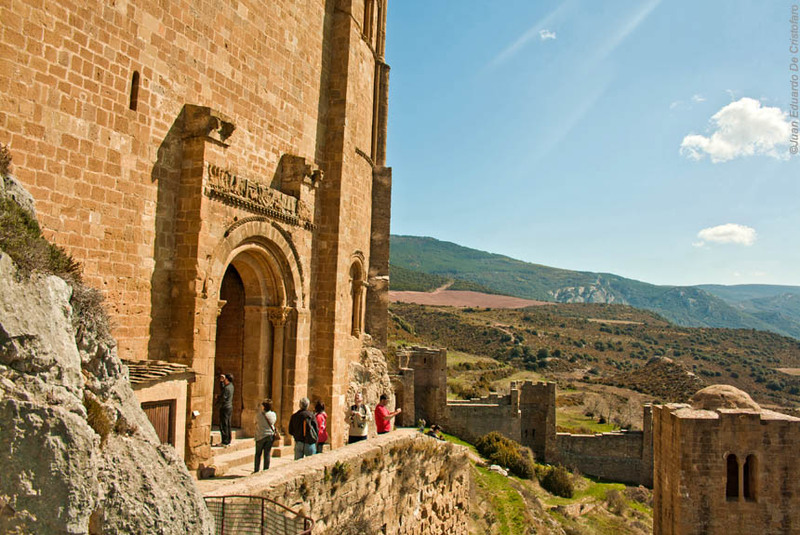 You begin by walking up to Loarre's impressive, archetypal castle with 8 magnificent towers. In the 11th Century, it was built on the frontier between Muslim and Christian territories. Latterly, it featured in the epic film Kingdom of Heaven. 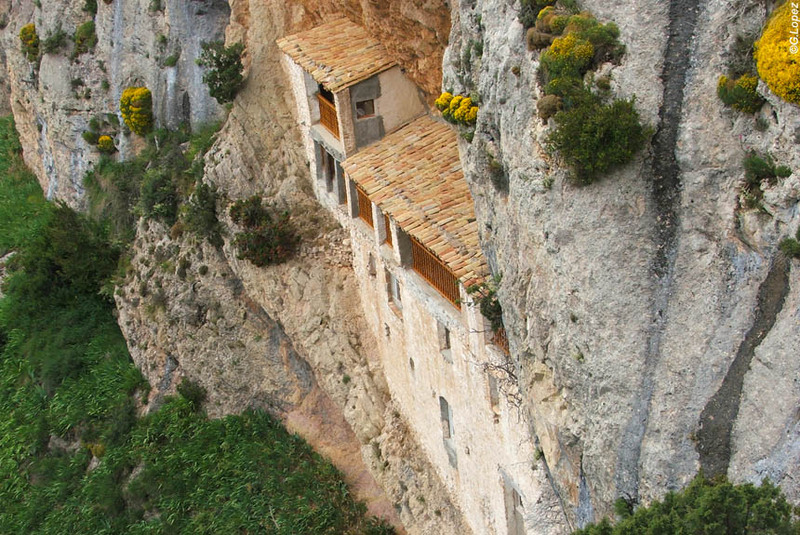 You then continue your walk along a balcony path and on to the simply stunning Hermitage of the Virgin of the Rock, built into the cliff face. It has been a sanctuary since Roman times, although what you visit dates back merely to the 13th century. From here you also have wonderful views south across the Ebro plain. You then finish with a descent through lovely woods and ancient stone steps. You stay at the three star Hospederia de Loarre, an historic building and hotel right in the centre of this unspoilt and charming village, where you are assured of a warm Arogonese welcome, all the 21st Century comforts you would expect - and some really good regional food and wine. Walking time : 4h30. Distance : 12km. Elevation : +400 / - 400 Transfer time : 1h15. Today there is a marvellous walk that begins by walking close to the castle (visit now or later) before a gradual climb, usually in bright sunshine, up to the Sierra de Loarre from where you get an utterly memorable panoramic view across the vast Hoya de Huesca plain - and so can understand why the Moors chose this location to spy on their enemies. The path continues through pine forest to the summit of Cerro Pusilibro - the highest point of the Sierra at almost 5,000 feet, so providing more marvellous views of this essentially unchanged landscape. It is an example, we believe you will agree, of why we are right to talk about the magic of Aragon. You then descend comfortably to Loarre to visit the castle, if you didn't do so earlier (or yesterday). You enjoy a second and final night at the Hospederia de Loarre (third night if you drove there). Walking time : 4h30. Distance : 15,5km. Elevation : + 850m / - 850m. Today you can expect to see large vultures flying below you, but the walking is not as demanding as that makes it sound, and as you will see from the ascent and descent figures below. You walk gradually up to the 11th century Romanesque chapel of San Miguel, and, a few hundred yards away, the remains of the castle built on a magnificent location, but now sadly neglected. From there you walk comfortably to the Mirador (Viewpoint) of the Vultures where you can enjoy the view of the amazing ochre Mallos cliffs - and you may well see climbers on them - the village of Riglos below (where you will be staying tonight), and above the kingdom of the giant vultures and other birds of prey. 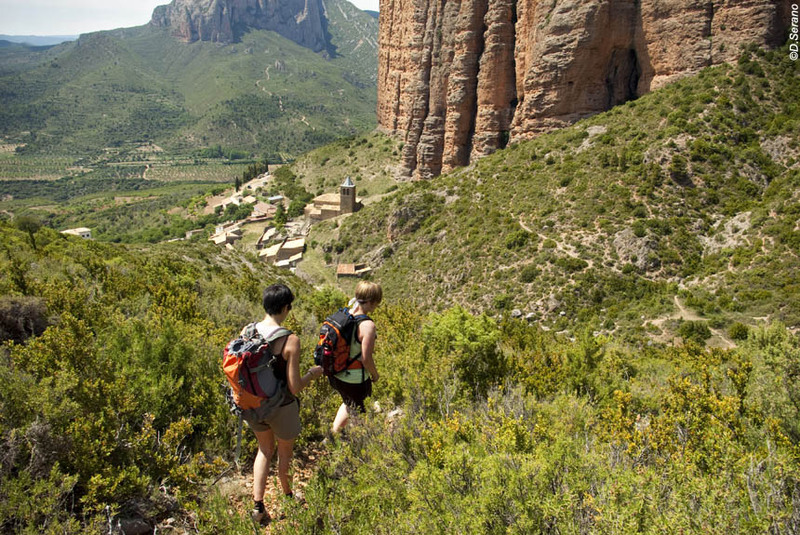 From there you descend on a good steady path with the 1,000 feet cliffs called Visera, Cuchillo and Pison awesomely still above you as you arrive in one of the most attractive villages in Aragon, Riglos. You will then have a short transfer to your hotel in Murillo. The four star Hôtel Aguas de los Mallos is in every way a treat. An well designed, stylish and contemporary hotel, it is still built of stone and is generous in its use of space (not least the height of public rooms). You may find its range of luxurious facilities focused on its spa very welcome after a day of walking. We are confident that the food will delight you too. Walking time : 5h30. Distance : 16km. Elevation : + 350m / - 450m. Your first highlight of the day is the 600 feet natural Puro "obelisk" after which you walk up between two of the Mallos cliffs. At the top you have the stunning sight of two immense pillars separated by a break in the cliffs through which you enjoy a magnificent view below of the often turquoise waters of the Rio Gallego river, fields of almond trees, olive trees and wheat. Above, you can appreciate the flying abilities of a range of large birds of prey, mostly suspended motionless before swooping at tremendous speed. You can choose an enjoyably challenging extension around the village of Arraso, or directly descend gently to the village of Murillo de Gallego where you spend the night. You stay a second night in the four star Hôtel Aguas de los Mallos. Walking time : 4h30 or 5h30. Distance : 9,5km or 13km. Elevation : + 450m or + 700m / - 600m or - 850m. Today you visit the second section of the Mallos cliffs and begin by walking to the village of Aguero. 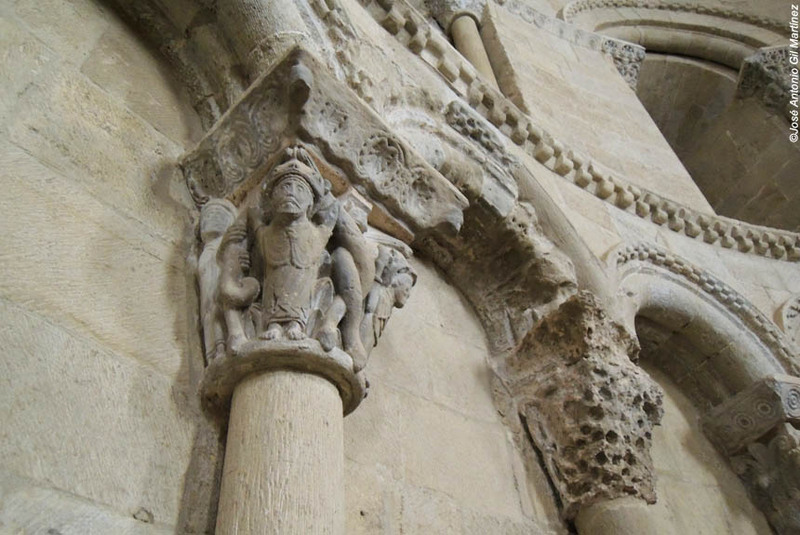 Do visit the 12th century Romanseque church with weird and wonderful carvings of beasts. You then take an ancient path which links Aguero with Villalangua, and offers a number of fascinating features: walking beneath the Mallos cliffs; hermitages cut into rocks; almost hidden shepherds' huts; amazing views, another "breach" in the cliffs; an abandoned village; a Roman bridge; a lovely waterfall. Pretty good, don't you think for one walk? And exactly what the "magic" of Aragon is all about. Villalangua is a pretty village which has often been described as being "at the end of the world" - so it feels like something of a privilege to be staying there. The Hôtel Posada de Villalangua is a simple but charming family-run hotel converted from a massive 19th Century stone workhouse. Bedrooms have stone walls, the terrace faces wonderful mountain scenery that includes a large colony of Griffon vultures, the restaurant serves exactly the sort of traditional mountain cuisine you'd hope for at the end of the world, and the welcome is equally authentic. Walking time : 5h30. Distance : 16,5km. Elevation : + 750m / - 650m. 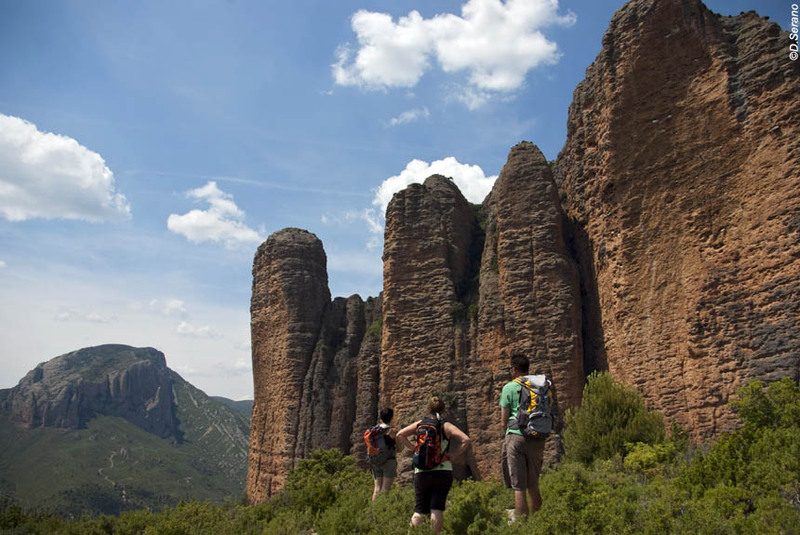 We begin this, your last walking day, with a transfer to the must-visit nature reserve of San Juan de la Peña and Mount Oroel. Much of it is forested with oaks. There are rare botanical species, plus wild boar, foxes, roe deer and Griffon vultures. It also offers stunning viewpoints that, on clear days, include the High Pyrenees mountains of Monte Perdido, Vignemale and Midi d'Ossau. You can begin by visiting the "new" monastery of San Juan de la Peña, merely 17th century. It features exceptional carving and an interactive presentation of the history of the Kingdom of Aragon which we think you'll find fascinating. A short path, which is a minor variant of the St James Camino (ending at Santiago de Compostela - many, many days away on foot), leads you to the superbly restored old monastery built under a huge rock originally occupied by hermits. In the 11th Century a monastery and church were built and this became the favoured religious location for the kings of Aragon. It flourished until a 17th Century fire resulted in the new monastery being built. Having explored these captivating sites, it is time to explore around the plateau! It perhaps suffices to say that the four star Hospederia Monasterio San Juan de la Peña lives up to expectations. However, a little more detail may help: it occupies the whole "new" monastery, and includes architectural features within what is now a beautifully designed boutique style hotel that uses local woods to great effect for walls and floors. With every comfort and great food, this all adds up to an appropriately memorable final night. Walking time : 2h or 5h30. Distance : 6km or 15km. Elevation : + 200m or + 650m / - 200m or - 650m. Transfer time : 45 minutes. Standard option: After breakfast, we transfer you back to Loarre to pick up your car. With extra airport pick-up: After breakfast, we transfer you back to Zaragoza. We can also arrange transfers to Madrid or Barcelona (please consult us for prices). If necessitated by flight times, you can stay the last night in Zaragoza at the Hôtel Catalonia el Pilar (with supplement). Standard option: You drive yourself to you first night's hotel, which will be in Loarre. The first night is on a dinner, bed and breakfast basis at the three star Hospederia de Loarre. This holiday features mostly comfortable rather than challenging walking, and is suitable for anybody who enjoys "a good walk". On most days the walks last 3 to 5 hours, but can take much longer if you so choose, and there are slightly more challenging extensions to walks on several days. It can get very hot in July and August, as well as more crowded, but the temperatures are moderated by being up in the mountains and you can always take a siesta during the heat of the day. We would recommend May, June, September and October as the best months. We will transfer your luggage between each hotel, so all you need to carry when walking is a daysack with whatever you regard as essentials. This is an independent, self-guided walking holiday. You stay in double or twin rooms for 3 nights in four star hotels, 2 nights in three star hotels, and 2 nights in simple mountain hotels. You will eat well. Dinners are based on set menus featuring regional specialities usually with 3 or 4 choices for each of three courses, but you can pay locally for upgraded choices. Breakfast is included every morning as are picnics on days when there are no shops or cafes/restaurants - and, anyway, you can always ask the hotel the night before to make a picnic, which you can pay for locally. A soft travel bag, avoid suitcases, which are more cumbersome and limit the weight of your belongings to 10 kg if possible. Please use soft travel bags, and restrict each bag to 10 kilos. You will also need a daysack of about 30 litres. You will know what to bring, but casual as much as smart casual clothing works for most evenings, and your priority should be comfort, especially for your feet! For walking, you will know what to bring, but we would recommend ankle protecting walking boots, a complete waterproof and breathable outfit, sunhat, plenty of sun protection, a 2 litre water container per person, waterproof map case, compass, head torch, mobile phone, small first aid kit, and a Tupperware container and utensils for lunches. No need for a visa. No vaccine is mandatory, but it is best to be up to date with your tetanus booster. 6 nights dinner, bed and breakfast, plus one night bed and breakfast; people transfers; luggage transfers; detailed walking instructions; map; 24/7 customer phone service. 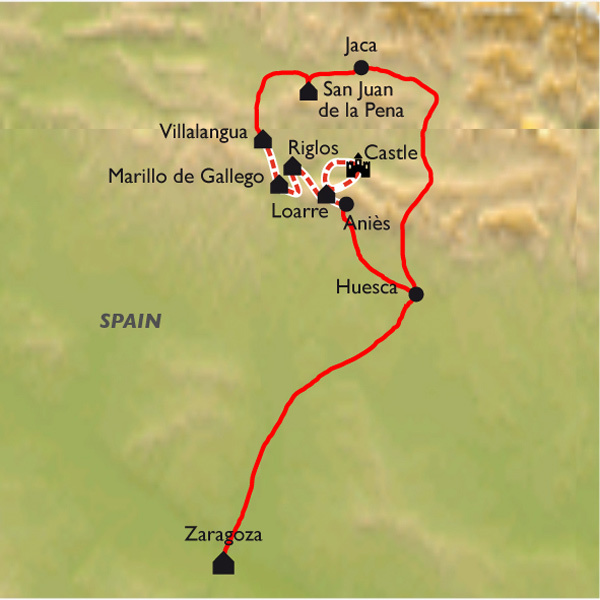 The journey to the start point, and from the finish point, except as specified; lunches; drinks with meals; non-standard menu items; entry fees; personal and travel insurance. "Where to go in the Pyrenees ? 3 of the Unmissables : the Cirque de Gavarnie (one of the most beautiful places in the Pyrenees), Lourdes (visited by well over five million pilgrims every year) and the Royal Monastery of San Juan de la Peña (a beautiful Monastery) !"